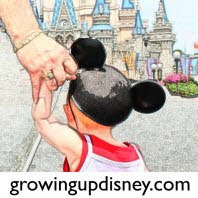 The Growing Up Disney family is taking a nice long trip to Walt Disney World, so watch the blog for stories and photos live from the parks. On Tuesday, October 26, Chris and I will be enjoying Mickey's Not So Scary Halloween Party and sharing it live on the blog. A big thanks to Kelly at Travel with the Magic for sponsoring this event! If you're in the area, please come by Writer's Stop at Disney's Hollywood Studios on Saturday, October 30 anytime from 2-4 and say hello. We have a little gift, while they last. Fingers crossed that everything goes as planned--we are heading over to the Cape to watch the penultimate shuttle launch on November 1. November 2 is a real treat for us. We get to play in the parks with my cousin Jeff and his family as a part of their first Walt Disney World vacation. Mommy Monday: Amy shared two articles, one on the wonderful Baby Care Centers available in the Disney theme parks and another on celebration buttons at WDW. Photo Flashback: DisneyDad shared a cute picture of Amy and DisneyMom on the Magic Kingdom train in 1979. DisneyDad on DVC: Ever wondered about the Grand Villas? DisneyDad recalls his stay in an Old Key West Grand Villa earlier this year. A Walk Around the World with Ridge: It's go time! Chris shared last minute preparations and an update on Jeff and Windy's trip. Can't wait to share lots of pics and stories with you from the parks!